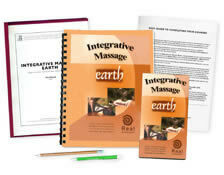 Already own the DVD Integrative Massage Earth? Call us at 1-800-364-5722, 9am to 5pm, to discuss your enrollment options. The Earth Massage is a deep, muscular massage designed to help ground your clients into a body that is free from fascial restrictions created from physical and mental tension. The course integrates Deep Tissue, Neuromuscular Therapy, Myofascial Release and Swedish Massage. Using the side posture primarily, the Earth Massage routine employs deep, compressive techniques that soften adhesions and muscle fibrosis, reducing the activity of myofascial trigger points, increasing the mobility of connective tissue and joints, and improving posture. Benefits also include muscle lengthening, increased range of motion, and improved posture. Perform this massage on clients with muscle tension, limited range of motion, or on people who can't lie face-down or face-up for long. The course video also includes a 5-minute Yoga routine for the practitioner. WOW! This course was A+, gold star. It was crystal clear and easy to follow. The clinical information was professional. The video was a wonderful guide. The test was done in such a manner to help remind technique and intention. I am sure I will be ordering the other courses in the future. I love the hassle-free and affordability of your home study. Thank you. You also included a return envelope! WOW - what a complete course. I am excited to use this massage technique on my clients. I already did once and my client said it felt amazing and she has had back pain for years. She has more range of motion from one session already. Very good, video was very good and supported the text book. The information in the book teaching the muscles and the trigger points was great. I liked linking the pain to which muscles to massage. I always use client volunteers to practice the course techniques and then get feedback in exchange for the work. This practice reinforces the new skills and gives a benefit to some of my regular clients. Reading the booklet. Then performing the moves on clients was interesting to see changes that enhanced mmovement for them. Enjoyed providing this modality. Watching the DVD aided in the flow of massage technique. Between the text and DVD this course was wonderful, easy to understand and retain information. Loved it. I have been using the Earth Massage routine on my clients for 5 months and they all have responded very well. They have all stated they feel better and most have not had recurring problems, and those that have stated their problems are decreasing. They are very pleased with the results they are getting. I appreciate the convenience of the home study program. I will look forward to have the materials for future reference. At first I was not thrilled about taking an online course, as I prefer to work with others and on others. This was a great solo learning experience though. It was easy to understand and I am looking forward to watching the video and practicing the Earth Massage with fellow therapist! This course was the best ever! I have been a massage therapist for 21 years, so this was a refresher course for me. It helped remind me of a few tidbits of forgotten information. And, at the same time it gave me the confidence that I still know my stuff! I'm looking forward to taking more of the Integrative Massage courses. I really liked the pattern of Earth massage and will use it on clients. Very enjoyable, informative course. Your website is easy to navigate which is much appreciated! Simple to follow and interesting. Loved it ! I look forward to incorporating these techniques into my practice! Great class format, video, and structure. Clear and concise information and pictures. I first got this in videotape form in 2006 but lost the tape. I have been wanting to have it again ever since and it was fortuitous that now I can earn CEUs for the technique that transformed my practice. Thank you! This was a very easy to follow routine, but very specific in technique. It truly accomplishes a lot for side-long enthusiasts. I'm very happy to do this course because the material was interesting and easy to understand since English is my second language. It was a great course. The information was clear, concise & very informative. Thank you! Great! Great! I thoroughly enjoyed reading and studying this course. Excellent massage for thick muscled male clients. I had forgotten about using the forearm and these techniques really save my hands and thumbs, and help to give a deep effective massage without getting warn out. This course was a vast improvement over my last internet experience. It was informative. It was well-written. And I learned something. Which was what I wanted. Thanks! Very good course and descriptions for new, serious MT’s. Good refresher for long term MT’s. This course is excellent! It has inspired me to bring my sessions into a deeper level, to the satisfaction for both myself and my clients. It has confirmed a direction that I have already had a tendency to take in my professional bodywork. Thank you so much. I really enjoyed this one! Lots of great ideas and techniques! Very easy to follow and understand. Define Deep Tissue Massage and identify areas of caution on the body while performing deep tissue massage. Describe Ischemic Compression and Trigger Points as they related to Deep Tissue Massage and discuss the nature of pain associated with this modality. List and discuss the characteristics of Neuromuscular Therapy. Explain the pain-spasm-pain cycle and how Neuromuscular Therapy interrupts this cycle. List and discuss the contraindications for Neuromuscular Therapy. Describe treatment manipulations used in Neuromuscular Therapy and appropriateness of each manipulation. List and discuss the endangerment zones on the body to avoid when performing Neuromuscular Therapy. List and discuss the 4 rules for performing Myofascia release techniques. Demonstrate a routine that utilizes Deep Tissue, NMT, Myofascial Release and Swedish Massage techniques specifically designed to releases tension, loosens muscles and frees restrictions. Give an intention for each technique used in this routine.